We all met in Columbia on a windy, 46 degree afternoon. It was COLD, and poor Chelsea was shivering terribly! We would shoot for about 5 minutes or less, then bundle her up in all of our coats until she was warm enough to brace the cold & wind again. She was SO tough and hung in there the entire time, not complaining once. It was so worth it though, because LOOK AT HER! She couldn't be more gorgeous if she tried!!!! I've always loved doing portrait sessions, especially creative portraits. Most people are a bit hesitant to do something fun & dramatic like this, but we wanted to show that it is possible and can turn out beautifully! Many brides are also hesitant to do large, dramatic bouquets, hair pieces & makeup, which is totally understandable. But again, we wanted to show that it can be done in a very tasteful & lovely way. Especially for photos, the bigger the better. If I were a bride again, I would do something different and dramatic like this. 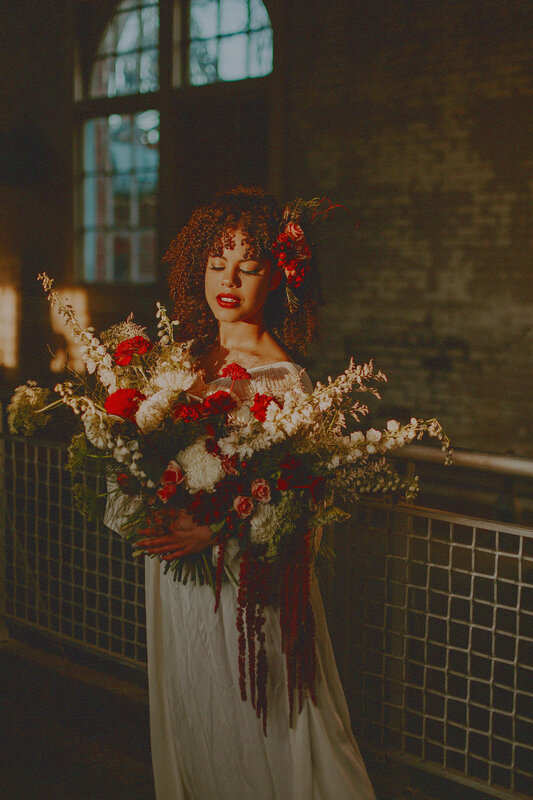 And if you're a bride out there & want to do something like this, but aren't 100% sold on the idea, Lexi & I were talking about the fact that you could do a big bouquet or floral headpiece for your bridals, instead of your wedding day. Because, who really wants to carry around a 15lb bouquet on their wedding day?! Yet, we thought this would give brides the idea and option of doing something like this for their bridals instead. I want to give ALL my love and gratitude for these incredible ladies. They seriously made this shoot come to L I F E and I couldn't have done this at all without them. The result of this photo shoot is due to their talent and work. Chelsea, I can't thank you enough for putting up with our crazy ideas and for letting us drag you out into the freezing cold weather to do these. You were absolutely perfect, graceful, and beautiful. You are such a wonderful girl & I so appreciate you sharing your beauty with us. Margaret Ann, I was just on the phone the other day with someone and told them how you literally are good at everything you do. And you could choose basically any career or hobby & be fantastic at it. It's slightly annoying and I'm kinda jealous, but I'll get over it one day ;) But for real, thank you for always sharing your talent and for always helping me with all my photo shoots for all these years. You're encouraging, full of joy, and always so selfless. I love you more than you know. Geneveive, we joked with you the entire photo shoot about how you wouldn't stop suggesting that Chelsea wear the white dress for some of the photos. But I am SO glad we listened to you because those are seriously some of my favorite images from this shoot. You always say that Mog & I stole all the talent in the family, but that is NOT true at all. You have such an eye for beauty, placement, and design. You give a fresh perspective on everything. Thank you for coming along and helping us out, it meant so much to me. I love you forever.